October 10th was a an international day of action against climate change. 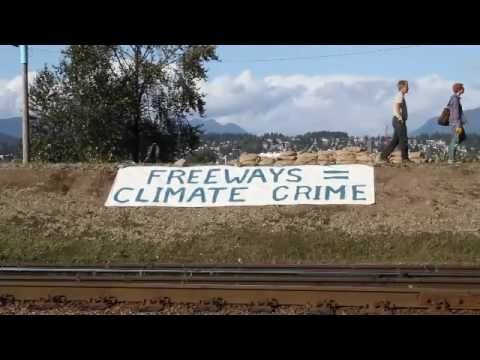 In British Columbia, activists used this opportunity to call attention to the Gateway Freeway, a massive highway expansion project that laying siege to natural habitats and communities along the lower mainland. Very well done. If people want more opportunites to play with sand we also have Sand For Shirley Campaign where we go to different events. People get to fill in a form saying what they would rather invest in than freeways and fill an envelope with preload sand. We are going to deliver the envelopes full of sand to Shirley Bond Minister of transportation. Our next event is Sunday October 17th at Bridgeview Hall Flea Market7 - 3 where we are fundraising for Burns Bog Society Legal Action Fund. All about tranist First Traffic solutions. Can sign Sand for Shirley on Line as well. http://www.thepetitionsite.com/1/sand-for-shirley/ and there is a link there to the website. Thanks for speaking to us Bernadette. Now could those envelopes be considered "suspicious packages" If you have any doubt make sure Charlie Smith from the Straight doesn't find out. Heh! Well we are not entrusting them to Canada Post that is for sure.